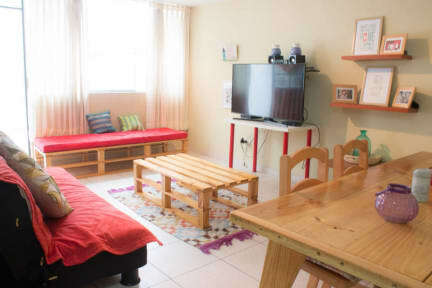 Arequipay Backpackers Apartment Guesthouse i Arequipa, Peru: Reservér nu! I am the owner of the Ärequipay Backpackers Downtown. My appartment is a big appartment that has a big kitchen full eqquipped, it has all that you could need. 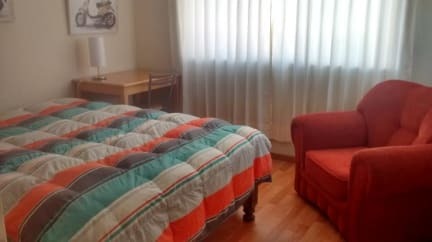 Also i have a Living room with a 42"Smart TV with netflix and laundry area with washing machine that my guest can use. Also wifi. Breakfast is included. I will be on vacation so i am renting all the rooms of my appartment. So if you are a group of 4 people this is a perfect place to stay! and very cheap considering all the facilities that am offering in my appartment. But if you are travelling alone, or with your couple of with your friend you can rent only the room and have access to al facilities. All my rooms has private bath, hot water waranty! Also my appartment has laundry area with washing machine that you can use. My appartment is 25 minutes walking distance to the main square. There is public transportation to downtown in front of my house and it takes only 8 minutes to arrive to downtown by bus. Breakfast is included and you can use the washing machine. Minimum of stay 2 nights.